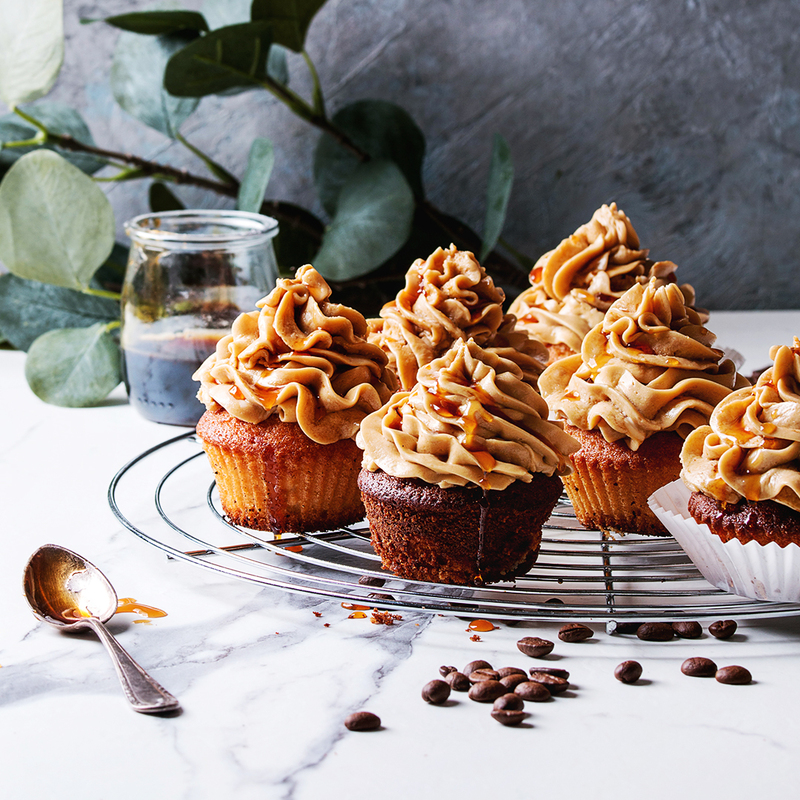 If you are a fan of butterscotch, then you will LOVE these cupcakes! 1. Preheat the oven to 350 degrees fahrenheit and line a muffin tin with 12 paper liners. 2. In a measuring cup, whisk together the milk, egg, egg white, vanilla, bourbon, and butterscotch flavor. 3. In a large bowl or the bowl of a stand mixer, whisk together the flour, cornstarch, baking powder, salt, and dark brown sugar. 4. With the mixer on low, add the butter one piece at a time until the mixture looks like moist crumbs. 5. Add all but 1/3 of the milk mixture and beat on medium speed for about 60 seconds. 6. Add the remainder of the milk mixture and beat on medium for an additional 30 seconds. 7. Scrape down the sides of the bowl with a spatula and beat for 20 more seconds. 8. Divide the cupcakes between the 12 paper liners and bake for 15-18 minutes, until a toothpick inserted into the center comes out clean. 9. Let cool completely on wire racks. 1. Combine the egg whites, brown sugar, and salt in a bowl (I used the bowl of my stand mixer). 2. Place the bowl over a pan of simmering water. The bowl should not touch the water, nor should the water be at a rolling boil. It’s the steam that’s going to heat the egg whites, since we don’t want scrambled eggs. 3. Heat the egg white mixture until it reaches 160 degrees fahrenheit if using fresh eggs (use the finger method if using liquid egg whites), whisking frequently so as not to get scrambled eggs. 4. Remove the bowl from the heat, and whip the egg whites on medium high using the whisk attachment of your stand mixer. 5. Whip the egg whites until they become fluffy and double in volume. The bowl should be neutral to the touch (this will usually take several minutes). 6. Turn the mixer down to medium low, and add the butter in one chunk at a time, until it has all been incorporated. 7. If the mixture looks curdled at this point, this is normal. Just keep whipping for a few more minutes until it comes together. If the mixture looks soupy, you can add a few cubes of chilled butter, or stick the whole bowl in the refrigerator for about 15 minutes and then continue beating. 8. Once the buttercream has become smooth, and the butterscotch sauce and beat until incorporated. 1. Use an apple corer to make a hole on the center of the cupcakes and scoop out the middle (leave enough on the bottom so the sauce will not spill out). 1. Fill each hole with butterscotch sauce and place the scooped out portion back on top. 2. Using a piping tip, pipe the frosting on the cupcakes. 3. Drizzle with the remainder of the butterscotch sauce and top with a few flakes of fleur de sel.